Adolf Hitler with George Ward Price in 1938. 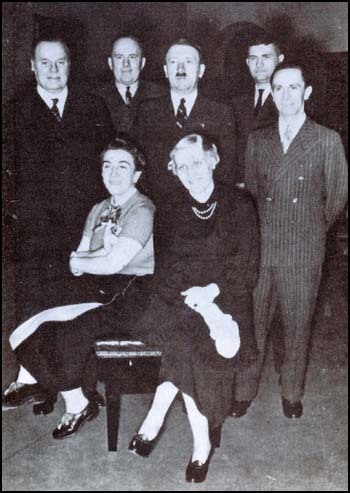 Ward Price was also a intimate associate of Oswald Mosley and a supporter of the National Union of Fascists (BUF). He was also a founding member of the January Club in 1934. The object of the group was to attract Establishment support for the BUF. Members included Robert Forgan, Francis Yeats-Brown, Sir Louis Greig; Lord Erskine and Lord William Montagu-Douglas-Scott. 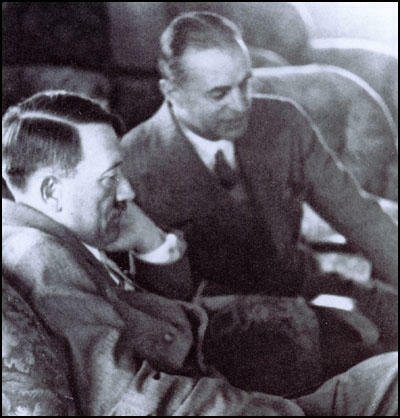 When Lord Rothermere, the owner of the The Daily Mail, took Ward Price with him when he met Adolf Hitler for the first time in December 1934. At the first meeting Hitler told Rothermere that “Lloyd George and your brother won the war for Britain. This was a reference to the Prime Minister David Lloyd Georgeand Lord Northcliffe, who it was claimed made sure that the British Army received enough munitions on the front-line during the later stages of the First World War. That evening Hitler held his first major dinner party he had given for foreign visitors at his official residence in Berlin since he had taken office. The high-level guests included Joseph Goebbels, Hermann Goering and Joachim von Ribbentrop. with Princess Stephanie and Magda Goebbels sitting in front. Listen to a Paul English and Andrew Carrington Hitchcock discuss this article on the radio below.